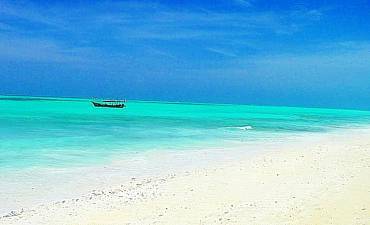 Reasons To Travel To Zanzibar For Holidays. 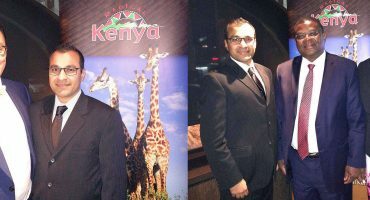 Scroll Down For Details..
An inimitable Indian Ocean island, off the coast of Tanzania, Zanzibar is the quintessential destination that affords superlative historical, cultural, exploratory and eco-tourism beach experiences in East Africa. It seems to have everything that any like-minded sightseer might look for. It has a distinct, ethnical history that is a remarkable amalgamation of the many travelers that passed through it for centuries. Arabs, Indians, Persians, European and even a trace of Chinese, each left an indelible mark in the form of architectural styles and culture that now contribute to its charm. Side by side is the rise and fall of many empires that left behind ruins and other remnants, but their presence is still felt in the blood of the traditional Zanzibarian. Along with strong Swahili influences, the Zanzibar you see today is unique in every respect from their cuisine to semantics, fruit and spices, furniture styles, the fabrics, the gorgeous hand-crafted artifacts and jewelry you find in their small duka stores and of course, the natural wonders that set it apart from any other island seaside destination in Africa. 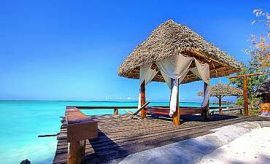 Think Zanzibar and you cannot help but ponder of the virgin beaches with their unspoilt, pristine white sands, scintillating turquoise blue of the Indian Ocean and the lush tropical vegetation that create a spell of beauty and tranquility. Even as alluring is the captivating marine life flourishing under the tepid waters of the ocean or the fauna of the Jozani Forest Reserve with its red colobus monkey denizens and many more. Visit Zanzibar with AfricanMecca and revel in the realm of splendor and serenity as you explore it along with the other islands of this breathtakingly dazzling archipelago. For Tour Planning Guidance On Zanzibar, Please Contact Us. 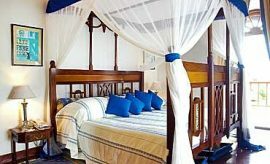 On your beachfront holiday in Zanzibar, stretch out on a quaint sisal daybed or get rocked to sleep in a hammock strung between two palm trees facing the turquoise Indian Ocean. The warm tropical sun peeks down at you from gaps in the leaves while the soft breezes scented with the unique fragrance of the spices growing on the island mingling with the aroma of organic coconuts, fruit and other flora surround you. There is an alluring freshness in the air, and as you slip into a languorous siesta, only the sounds of the gentle waves twirling on the unbelievably white sands and the rustling of the trees create a serene harmony. Though, you might detect the tunes of birds adding to the melody. As you awaken, the scintillating azure of the Indian Ocean greets your eyes with the sun rays skimming on the waves that are subdued by the reefs and coral formations under the surface. There is a mystical ambience all around that is pleasurable and tranquil. 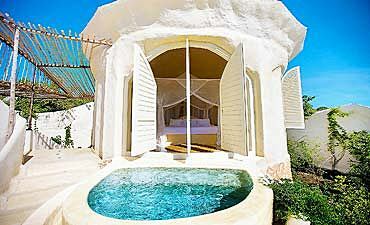 Bathe in the tropical sunlight or take a dip in the waters that feel a pleasant tepid on the skin. Emerge from the ocean to a delectable spiced meal of the scrumptious seafood, meats, vegetables and succulent fruits. As the tide goes out, you can walk along the natural pools on the shore to spot the tiny marine creatures stranded in them waiting for the next tide to come in. These are only some of the dream-like experiences you will have on your seaside vacation with AfricanMecca. Stone Town is the capital of the island of Zanzibar and has been declared a World Heritage Site by UNESCO. Walk through its narrow labyrinth alleyways while on your Swahili cultural tour and you will see why. This ancient metropolis has preserved traces of most historical events that occurred in it. The Anglican and Catholic churches remind you of the colonial advent on the island while the mosques, Omani palaces, the old fort and cannons talk to you of the yesteryear Sultan’s statehood presence. The intricate carved doors and latticed windows bring to mind the Swahili essence of the island while the fresh spices selling in the stalls talk of the island's ancient significance on the spice route. Zanzibar’s Stone Town has preserved most of its wonders and fiercely clings to the tranquil, laid-back pace of everyday life. Even today, you will find old men drinking kahawa (coffee) on the town squares baraza while kids play around happily along the alleys and around the gardens of Forodhani. The old houses crafted with coral limestone; their plaster peeling off and lichens adorning them shade the labyrinth lanes that lead you through the market stalls. It is easy to see why it was a shopper's paradise in the past. You can buy exquisitely carved artifacts, beautiful jewelry, varied seafood fresh from the ocean, luscious organic fruits harvested from a nearby farm, incredibly distinct traditional clothing from kitenge to Swahili dresses and so much more. Visit Stone Town on your day excursion of Zanzibar with AfricanMecca and lose yourself in a long-gone era. 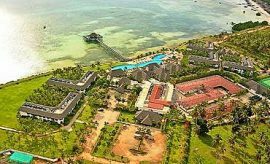 As you will appreciate when traveling in Zanzibar, it is not a single island, but an archipelago made up of many small and large islands. Some of the smaller islands are actually ancient coral formations over which vegetation has formed a green cover and now house many unique creatures. But it is the underwater marine realm that is captivatingly beautiful. As you slip into the warmish waters, you will enter a paradise illuminated only by the sunshine filtering down. It lights up the many hues of the living coral and the multi-colored diversity of pelagic, demersal and coral fish denizens. There are both shallow and deep sites you can explore, and that makes these reefs ideal for snorkeling and scuba diving around Zanzibar sites. The underwater shipwrecks around Zanzibar Island have been adapted as reefs, and experienced divers can explore the wondrous nooks and crannies of the craft. Few of the islands are now protected marine reserves, and there are many pristine sites that are as yet undiscovered. Mnemba Atoll is a superlative dive site located on the northeastern zone of the island near Matemwe. You can also snorkel here. Chumbe Marine Park only allows snorkeling to ensure maximal protection of its low lying reefs. Aquatic fauna seen during snorkel and dive excursions in Zanzibar are parrotfish, triggerfish, angelfish, octopus, glassfish, sweetlips, butterflyfish, green turtles, nudibranchs, moray eels, lionfish, moorish idols and many more. Your ocean trip to Africa during the migratory season can earn you thrilling sightings of humpback whales and plankton eating whale sharks. Even in modern times, like it did in the ancient world, Zanzibar’s spices attract aficionados from all over the globe. The incredible habitat of the island is ideal for growing many spices such as cinnamon, chilies, nutmeg, black pepper, ginger, cloves, bulls heart, turmeric, lemon grass and many more. 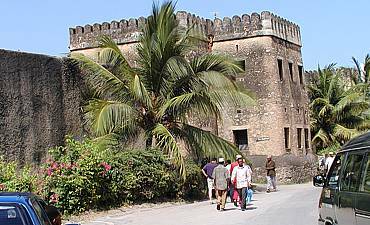 Visit the spice plantations when vacationing in Zanzibar and enjoy viewing them as they ripen on the trees. You could also pluck them from its shrubs and trees, and learn about the amazing processes by which they are readied for use. When touring the spice and fruit farmlands, you will learn more about the amazing properties of the seasonings. Aside from the individual flavors they lend to any kind of cuisine, some have amazing medicinal benefits and can be used to cure many ailments. Learn from the village locals the home remedies they can concoct. Spices are also used as coloring and as a component in cosmetics. You could also chance to view the fascinating clothing that is dyed for weddings and special events using the colors extracted from the spices. Watch the cinnamon being harvested from the bark of the tree and exotic fruits brought down from the trees. Enjoy them in their organic taste, and you can try and match them to the processed products you find in your local grocery store. 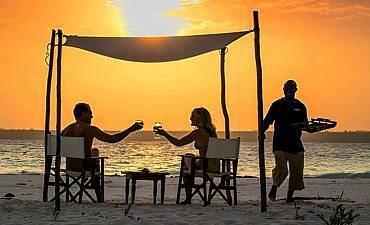 If you are looking for the ultimate accommodation experience on your boutique beach vacation in Tanzania, you can choose from the some of the authentic, distinctly luxury options the archipelago of Zanzibar has. 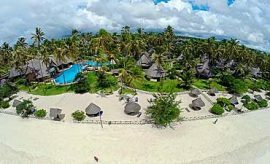 When staying at these accommodations, you can expect a serene time to yourself with only the incredible beauty of the turquoise waters of the Indian Ocean, powdery-soft white sands, verdant tropical vegetation and fascinating avian, terrestrial and marine fauna. The tepid waters are crystal clear and ideal for swimming, snorkeling and diving. Your stay at the Mnemba Island Lodge, Baraza Resort & Spa, Matemwe Retreat, The Palms, Kilindi, The Residence and others, all intimately and individually characterized by exquisitely decorated rooms, opulent living spaces, sumptuous cuisine, specially cooked to your tastes, discreet service and a host of facilities such as a private plunge pool, elegant spa, library, patio gardens, infinity pools and much more. Revel in the utmost comfort and pampering, and schedule the various coastal and marine activities available from your hotel. All amenities, facilities, gourmet cuisine and fine wines are included, and the ambience of the island will weave a spell of utter allure all around you. Zanzibar has many designated deep sea sites where you can try your hand at fishing during your African travels. Both amateurs and seasoned anglers can book a custom-built boat and an AfricanMecca assigned skipper that will channel you out to the deeper waters far from the islands. This is to avoid dropping an anchor or fishing on the protected reefs and damaging the delicate coral. The boats are well-equipped and carry all the supplies you could possibly need. The experienced skipper on board will help beginners with the intricacies of casting while the experienced guests can receive the assistance they need to raise and land their catch. Positively, conservation and sustainable sport fishing regulations require that you tag and release your catch. Under special circumstances, you might be allowed to keep you catch. Although, you can enjoy a deep seas fishing trip in Zanzibar during all the months of the year, there are some specific months such as from November to March when you can try raising billfish including blue marlins, sailfish, black marlins and also striped marlins. You could spot large tunas, wahoo, barracudas, trevally and many more. Should you visit during the months from August to November, you could chance to snag a yellowfin tuna. Your fishing trips will be made all the more stirring with detections of sharks like mako, tiger, hammerhead and thresher. Zanzibar offers a range of thrilling customizable activities aside from Stone Town, spice farm, diving, snorkeling and fishing excursions that you can sample when on your seaside vacation in Africa. 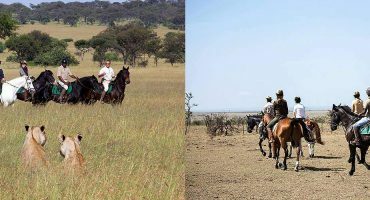 For instance, picture yourself riding a beautiful, well-trained horse on the gorgeous white sands of Kiwengwa Beach with the warm sun on your face and the breeze swaying your hair. Quad biking is yet another adventure you can go on, and both children and adults are welcome to try. Perhaps, the most interesting part of this adventure is the visit to little Zanzibari hamlet that you can only reach by quads. Relax your mind, body and soul by taking yoga classes with Jo Fox. You can choose from the diverse sites around the island and also opt for private lessons. If you enjoy active-water activities, try the kitesurfing and windsurfing. AfricanMecca guests that are trying their hand at active sports for the first time can opt for lessons from expert instructors. Do add a visit to the Seaweed Center in Paje to your itinerary during your distinct tours of Zanzibar and learn about the fascinating sustainable work they are doing by training women in seaweed farming. 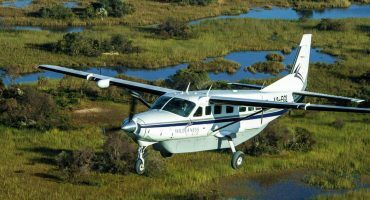 Other distinct excursions are biking, yachting, jet-skiing, fly-boarding, water-skiing, wake-boarding, parasailing and many more. To sample the most authentic eco-tourism experience in Zanzibar, AfricanMecca recommends you stay at Chumbe Island Lodge while eco-holidaying in Tanzania. The incredible experience at Chumbe allows you to appreciate the wonders of living in an environment that is completely in tune with nature. You will be staying in spacious pastoral chalets that are entirely constructed with naturally occurring materials while the furniture is crafted by hand out of wooden poles. Captivating African motifs are drawn on the floors of the rooms furnished with swinging daybeds hanging from the ceiling on the lower floor. Rainwater is harvested and later filtered by eco-friendly methods for use. After use, the water is once again filtered and directed towards the watering of plants. Another interesting factor is that the plant beds are specially constructed so that the water does not reach the reefs. Eco-friendly toilets recycle waste into compost and prevent it from percolating into the porous ground where it can eventually damage the reef formations. The electricity you use is generated by the solar panels installed on the roofs of the chalets. Ocean breezes provide the cooling you need and waft through the intentional open structures scenting it with the aromas of the tropical vegetation. Lower the lattices or raise them to allow the sunshine and light zephyrs in. Later go for long walks on the powdery white sands and rock pools and enjoy tranquil castaway moments on your eco-travel in Zanzibar. Hidden away in the heart of Zanzibar, covering 50 square kilometers of incredible natural beauty is the Jozani Forest Reserve, a must visit on your tour of this Indian Ocean Island. This reserve was designated as a protected area in the 1960s. Thanks to its establishment, the rare and endangered kirk’s red colobus monkeys have received a new lease of life and are slowly recovering from the brink of extinction. There are now an estimated 2500 of this beautiful mammalian life in the reserve. You can see them swinging in the trees or foraging in the bushes, and since they are forbearing of human presence, you can take all the pictures you want. Jozani Forest Reserve forms a part of the Jozani Chwaka Bay National Park and houses many species of unique plants and trees. Your walks along the trails in the forest will treat you to the sight of sykes’ monkeys, chameleons, bush babies, lizards, frogs, varied birds, the shy Ader's duiker, suni antelope and more. The Uzi and Chwaka Bays form eastern boundaries for the reserve, and the mangrove forests that thrive here are perfect habitats for diverse marine life like turtles, crabs, mollusks and more. There are many salt marshes around the bay, and you can go exploring the dry coral rag forests that are inundated with tidal waves every season. Lose yourself in this wondrous world during on your wilderness holiday in Zanzibar. There are small islets around Zanzibar such as the Mnemba, Chumbe, Chapwani and others. 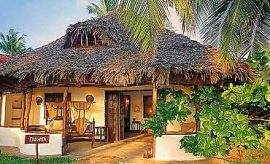 These isles offer you the rare experience of living on a private island for the duration of your Indian Ocean holiday in Tanzania. These islands host only a few rooms for like-minded guests and you can spend your detox vacation in complete seclusion from the outside world. Mnemba Island in the east, covered with casuarina copses entertains not more than 20 guests (10 rooms) at a time. Here, you will be staying in eco-friendly beachfront bandas with miniature suni antelopes and other island avian denizens roving around. In the west, Chumbe Island forms a part of a protected coral reserve. 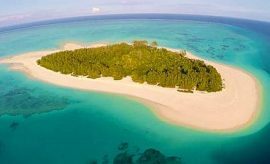 When you spend time here, you will be amazed to see how humans can live without leaving a footprint on the environment. Learn about the ingenious methods by which waste is disposed of and energy created from solar power. Chapwani Island also on the west offers you the sight of varied fascinating marine creatures that are left stranded in the pools left by the receding tide. As you walk along the seashore, you could spot egrets, white herons, coconut crabs and hermit crabs. The island also has a small population of dik diks. Go on snorkeling expeditions around the private islands and revel in the splendor of the ocean on your travels in Zanzibar.